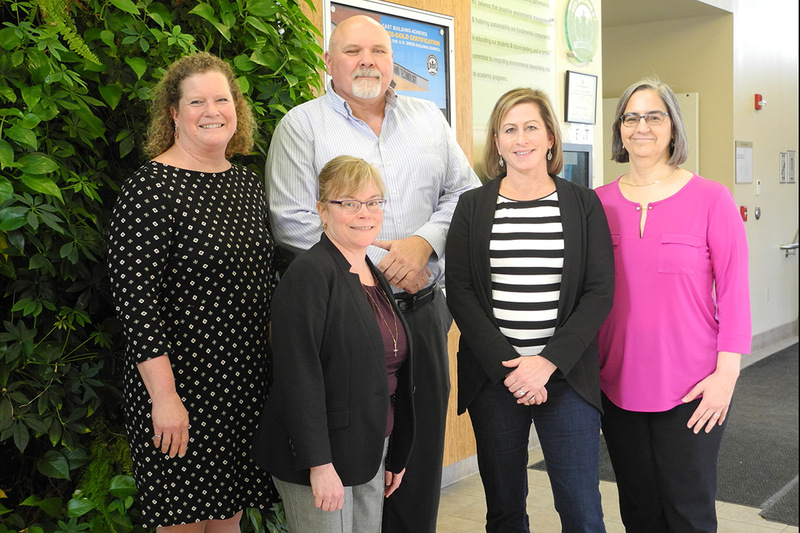 Faculty-researchers in RIT’s College of Engineering Technology who worked on the new curriculum modules are (from left) Maureen Valentine, Jennifer Schneider, Joe Rosenbeck, Lisa Greenwood and Gretchen Wainwright. Students at RIT are learning about risk management and planning even before entering the workplace through a new series of systems-based educational tools integrating community and enterprise risk and sustainability management. Faculty-researchers at Rochester Institute of Technology created a set of class modules for degree programs in RIT’s College of Engineering Technology through funding from the U.S. Commerce Department’s National Institute of Standards and Technology (NIST). The modules are standards to apply professional guidelines pertaining to the environmental, health and safety and community sustainable development. Students have the advantage of learning about the standards needed when developing and planning for risk mitigation in industry and in communities, as well as hands-on application using the standards. NIST is a government agency that describes the practices and measurements for developing consumer products through a series of guidelines, adopted by industry toward competitiveness in areas from communications technology and cybersecurity to advanced manufacturing and disaster resilience. There are more than 22,000 standards across varied business and community sectors. Management systems for community sustainability development, to enhance sustainable design and improve incident response and resilience practices. “What we’ve done is set up these educational modules to satisfy an expanding view of risk and potential impacts. Having a system-based framework allows for flexibility based on a specific type of company or community and its particular risk with the goal of sustainability. This is a unique and more holistic way of looking at risk,” Schneider said. Work done consists of more than 200 pages of materials and information within each of the modules, including activities, exercises and projects as well as links to related materials. It is a comprehensive collection available to the college’s onsite and online students. Valentine was part of the team, led by Schneider, that also included Joseph Rosenbeck, professor and graduate program director; Lisa Greenwood, assistant professor; and Gretchen Wainwright, senior lecturer, and undergraduate program chair The group received a grant for $75,000 in 2016 from the U.S. Commerce Department’s National Institute of Standards and Technology (NIST) to develop standards educational modules for RIT’s College of Engineering Technology. The award for “Standards-based curriculum and capacity-building across risk prevention management system domains: health, safety, environmental and community sustainable development,” enables graduates to apply risk management strategies in a variety of community organizations and industries.